Relocation of housing from the tsunami- devastated lowlands near the seashore (Photo 1) to elevated land is among the ideas that will be discussed in a government-convened council of officials from the quake-hit regions and city planning experts1. The housing relocation in the Sanriku coastal areas will change the land use pattern of the elevated areas presently with the combination of homesteads, cultivated fields and forest plantation. Abandoned cultivated land in these areas is a possible location for settlement reconstruction. Especially since the early 1990s, the abandoned land has expanded in the process of rural depopulation and ageing. 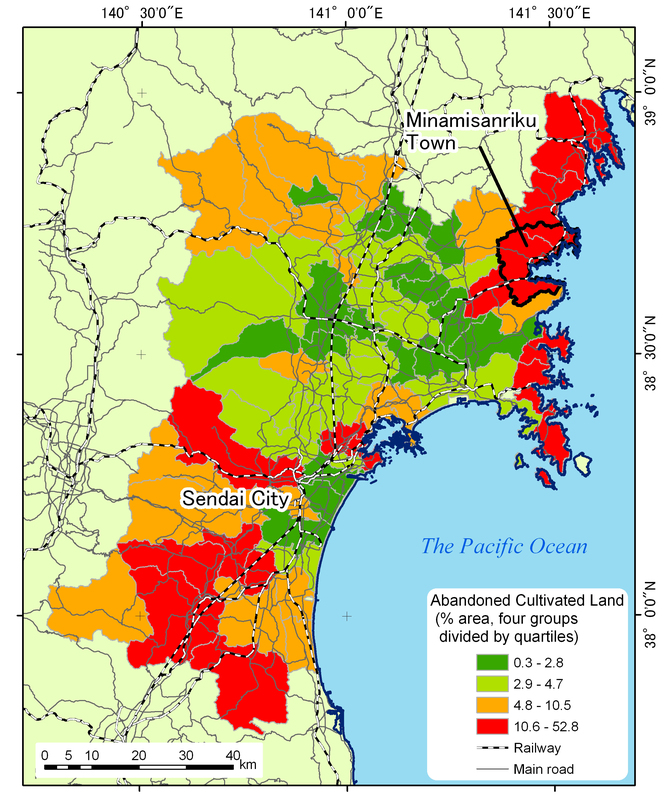 In Miyagi-ken (Figure 1), one of the Prefectures devastated by the 2011 East Japan Earthquake, the abandoned cultivated land started to expand in its southern part where upland farming is more prevalent and the area of farmland per agricultural household is relatively small. In north Miyagi, while paddy rice cultivation has slowed down the field abandonment to some extent, the Sanriku coastal area with the southern edge of Kitakami Mountains has undergone substantial upland farm abandonment where paddy cultivation is minimal. 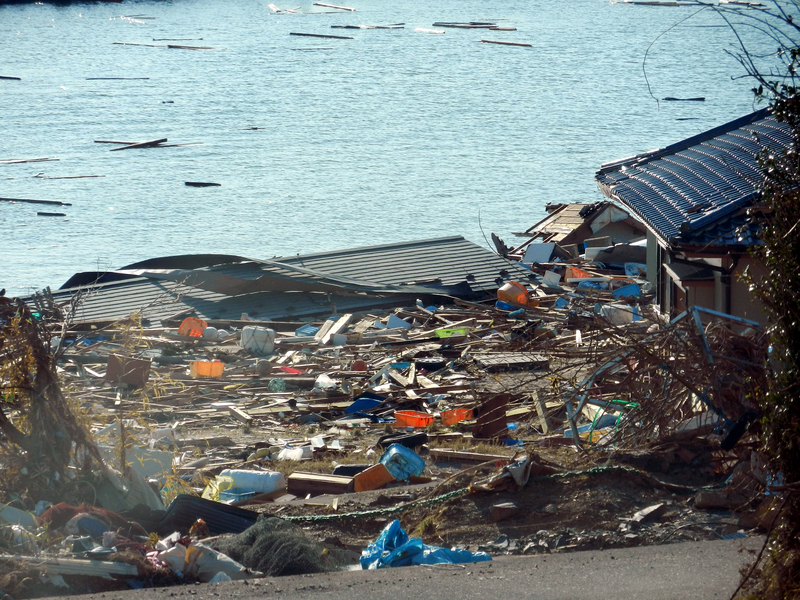 The percentage of abandoned land to the total farmland was very high in the former Utatsu Town (33.8% in 2005), now a part of Minamisanriku Town (population in February 2011: 17,666), which was among those hardly hit by tsunami. In its Tomarihama settlement (about 600 residents), wheat price decrease after the mid 1980s accelerated field abandonment, and fishery and guest-house management for tourists became more important, thus expanding abandoned fields2. 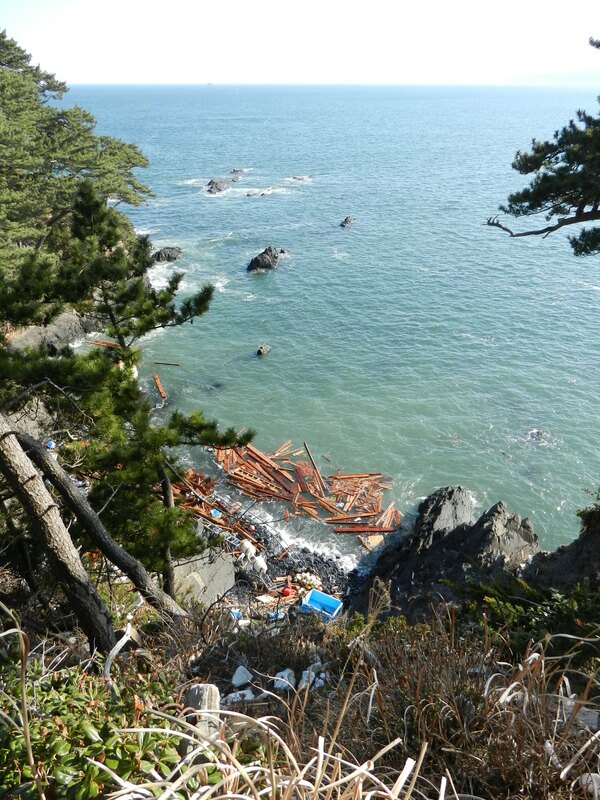 This upland parcel was free from the tsunami strike. It was full of sunflowers in the summer of 2010. 1The Asahi Shimbun English Web Edition, http://www.asahi.com/english/TKY201104020271.html, as of 8 April, 2011 (in English). 2Information based on K. Asai 2011. Factors of farmland abandonment and forms of reuse in Miyagi Prefecture: the case of Tomarihama, a part of the former Utatsu Town, graduation thesis, Division of GeoEnvironmental Science, Department of Earth Science, Tohoku University (in Japanese). 3Minamisanriku Town Web Site, http://www.town.minamisanriku.miyagi.jp/modules/photos/photo.php?lid=457&cid=1, as of 8 April, 2011 (in Japanese, with a landscape photo). 4NHK (Japan Broadcasting Corporation) News Web Site, http://www3.nhk.or.jp/news/html/20110331/k10015022831000.html, as of 31 March, 2011 (in Japanese).